GRANT, THOMAS HUNTER, businessman and militia officer; b. 6 July 1833 at Quebec, son of Peter Grant, a printer, and Margaret Thompson; m. 7 Aug. 1864 Caroline Drum in Sillery, Lower Canada, and they had one son; d. 2 June 1917 in Brighton, England. Almost nothing is known about Thomas Hunter Grant’s childhood. He studied for a time at Quebec with a view to entering the church but eventually opted for a career in business. He went to work first as a cashier for H. J. Noad and Company [see Henry John Noad*], where he remained at least until May 1859. During the same period he ventured into business on his own, forming a partnership with George Cappage Gibsone of Quebec in February 1855 under the corporate name of Gibsone, Grant and Company. The new general merchants invested £400, intending to do business with the “downriver ports.” Gibsone managed business dealings outside the city, while Grant looked after running the company in Quebec itself. The enterprise was eventually dissolved in February 1858. Grant had now gained some business experience and was eager to achieve success as quickly as possible, but since he had little capital, he joined an established enterprise. In April 1862 he went into partnership with John Lemesurier, a well-known Quebec merchant, forming Lemesurier, Grant and Company. Although he owned one of the three shares, Grant had invested only $500 in a firm with a net value of $10,000. In August 1864, however, he married Caroline Drum, who brought a dowry of $8,000. The following month Lemesurier and Grant borrowed this sum from her and promptly put it into their enterprise, which was centred on the wholesale and grocery trade and on their tobacco factory. That year the partners also had a ship built, the 251-ton Jenny-Lemelin, but on 1 April 1865 they ended their association. In January 1868 Grant ventured once more into the business world, in partnership with Isaac Thompson, a maternal uncle who lived in Leeds Township in the county of Mégantic. Grant invested $2,000 in the company without accepting liability for any debts it might incur. His share of the profits averaged $300 a year. He also had decision-making power and a veto. On 1 Jan. 1871 Isaac Thompson and Company was dissolved and Grant recouped his investment. Apart from these commercial involvements, he made a name for himself with various Quebec insurance companies. For instance, he was secretary and manager of the Quebec Marine Insurance Company from 1866 to 1877, and from 1869 to 1873 he was an agent for the Canada Life Assurance Company. Grant devoted the greater part of his career, however, to the service of the Quebec business community. A consultant to the Quebec Board of Trade in 1865, he became its secretary the following year and held this office until 1875. Very active and highly regarded, he made the board, which had been quite unimportant at the time he joined it, into one of the strongest and most influential organizations in the country. He introduced a host of measures that greatly facilitated maritime trade with the port of Quebec. In 1865 the board made him its delegate to a convention in Detroit at which the future of the reciprocity treaty with the United States was discussed. During a plenary session of the Canadian delegates he proposed that a central board of trade be set up. The Dominion Board of Trade would eventually come into being in October 1870. Grant also served as the commercial representative for the Quebec Board of Trade at conventions in New York, Chicago, Boston, St Louis, Mo., Portland, Oreg., and several Canadian cities. In February 1867, to promote stable business relations with the Maritimes, Grant played an active role in founding the Quebec and Gulf Ports Steamship Company. He helped in March 1870 to set up the Society for the Promotion of Local Industry and was elected to its first board of directors. In May 1873, along with his father-in-law William Drum and a few other Quebec businessmen, he founded the Stadacona Bank, of which he would become a director. The Drum furniture factory, which provided work for hundreds of employees in the city of Quebec, burned down in August 1873. Lacking capital to start it up again, Drum and bank shareholders such as Timothy Hibbard Dunn* created the Drum Cabinet Manufacturing Company. Although he was not involved financially in the fortunes of the enterprise, Grant nevertheless played an important role in them through the family shares held by his wife. Appointed to the Quebec Harbour Commission in August 1873, he served on it until 1876. He was very actively involved in this capacity, especially in working for improvements to the harbour. He was amongst the commissioners sent to Ottawa and London in an endeavour to obtain government investment in this project. One result of these efforts would be the construction of the Louise Basin and the Lorne Dry Dock in Lauzon (Lévis). In 1874 he was one of the shareholders of the Quebec Building Society. 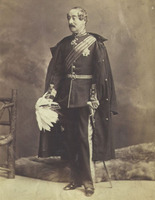 Grant was a staunch loyalist, and shortly after the Trent affair in 1861 [see Sir Charles Hastings Doyle*] he had helped raise a militia artillery company at Quebec. He was given a commission and rose through all the ranks before retiring in 1873 as an honorary lieutenant-colonel. He had never been politically active, but he had been urged to run for office on several occasions, including the municipal election of 1870 in Quebec and the provincial elections of 1867 and 1874 in the riding of Mégantic. A supporter of Canadian confederation, Grant declared himself in favour of protectionism in a speech given to the Literary and Historical Society of Quebec in 1867 and later published. He had many admirers and also some critics; the short-lived satirical newspaper the Arrow made him one of its favourite targets, focusing especially on his marriage to the daughter of a rich factory-owner. Thomas Hunter Grant left Canada about 1879 and went to live in England. He is remembered, not as a prosperous businessman, but rather as a citizen who left his mark on the economy of Quebec City by his valiant efforts to keep it going at a time when it was losing momentum. Thomas Hunter Grant’s address before the Literary and Hist. Soc. of Quebec was published as The future commercial policy of British North America . . . (Quebec, 1867). ANQ-Q, CE1-66, 22 sept. 1833; CE1-79, 7 août 1864; CN1-43, 29 janv., 8 sept. 1864; 28 janv. 1868; 1er nov. 1870; CN1-294, 26 févr. 1855, 4 avril 1862, 1er avril 1865; P1000, D892; T11-1/28, nos.534 (1858), 1567 (1874). Arrow (Quebec), 6 April–31 Dec. 1864. Daily Telegraph (Quebec), 6 June 1917. Morning Chronicle (Quebec), 1860–1900. Quebec Daily Mercury, 1865. Times (London), 5 June 1917. Canada Gazette, 1867, 1870–71, 1873–74. Canada Gazette (Can., Prov. of), 1862, 1865. Canadian men and women of the time (Morgan; 1912). Directory, Quebec, 1855–80. Dominion Board of Trade, Abstract of proceedings at the meeting of representatives held in Montreal to organize a dominion board of trade, 5th and 6th October 1870 ([Montreal? ], 1870). Quebec Official Gazette, 1875. Jean-François Caron, “GRANT, THOMAS HUNTER,” in Dictionary of Canadian Biography, vol. 14, University of Toronto/Université Laval, 2003–, accessed April 24, 2019, http://www.biographi.ca/en/bio/grant_thomas_hunter_14E.html.